Track 4 "De/Vision Feat. Crystin Fawn - Brotherhood Of Man (Hearhere's Clubbed To Death Remix)" is marked as exclusive. Track 1 published by Alstermusikverlag (AMV). Track 2 published by Hall of Sermon Publishing. Track 3 published by Sony Music Publishing. Track 4 published by EMI Publishing / Edition Unterstützer. Track 5, 6 published by Les Editions Alfa Matrix. Track 8 published by MRDTC Recordings. Track 1 "Tomorrow Never Comes (Reaper Remix)" originally appears on 'VNV Nation - Crossing The Divide'. Track 2 "Irgendein Arsch Ist Immer Unterwegs" originally appears on 'Lacrimosa - Revolution'. Track 3 "Amnesia (Radio Edit)" originally appears on 'Dead Can Dance - Anastasis'. Track 4 "Brotherhood Of Man (Hearhere's Clubbed To Death Remix)" originally appears on 'De|Vision* - Rockets + Swords'. Track 5 "Enjoying The View" originally appears on 'Metroland - Mind The Gap'. Track 6 "Less But More" originally appears on 'Aesthetische - Powerswitch [LTDPWR]'. Track 7 "No First Use Policy" originally appears on 'Full Contact 69 - Man Machine'. Track 8 "Liar (7" Edit)" originally appears on 'MRDTC - #1 [Liar]'. Track 9 "Running Out (Club Mix)" originally appears on 'Enter And Fall - Push Enter And Fall Down'. Track 10 "Always Death" originally appears on 'Nova-Spes - Leben Ist Krieg'. Track 11 "I Don't Speak Human (Special Live-Version)" originally appears on 'Omnia - Live On Earth'. Track 12 "The Traveler" originally appears on 'Accolade (3) - Festivalia'. Track 13 "Wind And Tree" originally appears on 'L.E.A.F. - Leaf'. Track 14 "Planned Obsolescence" originally appears on '16Pad Noise Terrorist* - Evilution'. Track 15 "Alkaline" originally appears on '<1979> - FM Interface'. 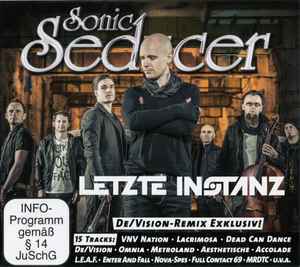 Comes in a 4-panel Digifile with Sonic Seducer magazine issue 2012-09; no booklet, no lyrics.